The global credit crunch that began in 2007 threw the financial industry into turmoil and highlighted the need for financial firms to improve their risk management practices. Today, the credit crisis is far from over. Markets remain volatile, and finan-cial firms face waves of regulatory requirements intended to safeguard the solvency of individual firms and the stability of economies worldwide. These reforms will dramatically affect firms — burdening the profitability and growth of some, and the very survival of others. 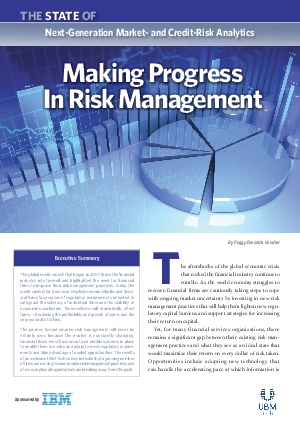 The journey toward smarter risk management will never be entirely over, because the market is constantly changing. Financial firms must have smart and nimble systems in place to enable them to evolve and adapt to meet regulatory require-ments and take advantage of market opportunities. The results of an exclusive UBM Tech survey indicate that a growing number of firms are moving toward smarter risk management practices, and a few exceptional organizations are breaking away from the pack.